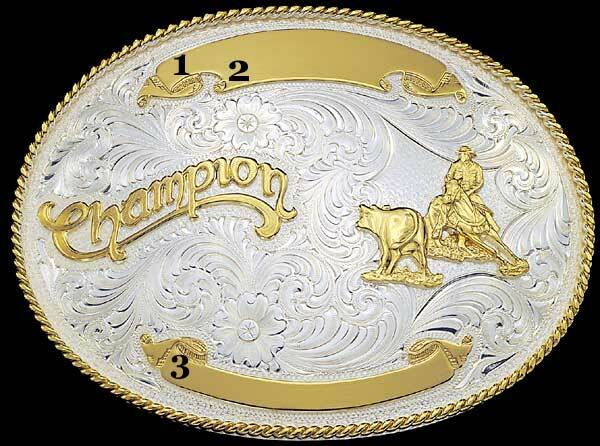 Montana Silversmiths custom champion buckle 943. 3¾" x 5". Includes any figure and "Champion" overlay. Will display up to three lines of engraving. Shown here with Cutting Horse figure #7. Option: Add one stone to the center of each of the two flowers seen in the silver filigree work. See "Extras" below. This custom champion buckle is also available in solid sterling silver (usually price x 3); contact us for a quote. Download the Catalog of Figures here. This Champion Buckle is also available with an Antiqued Patina.